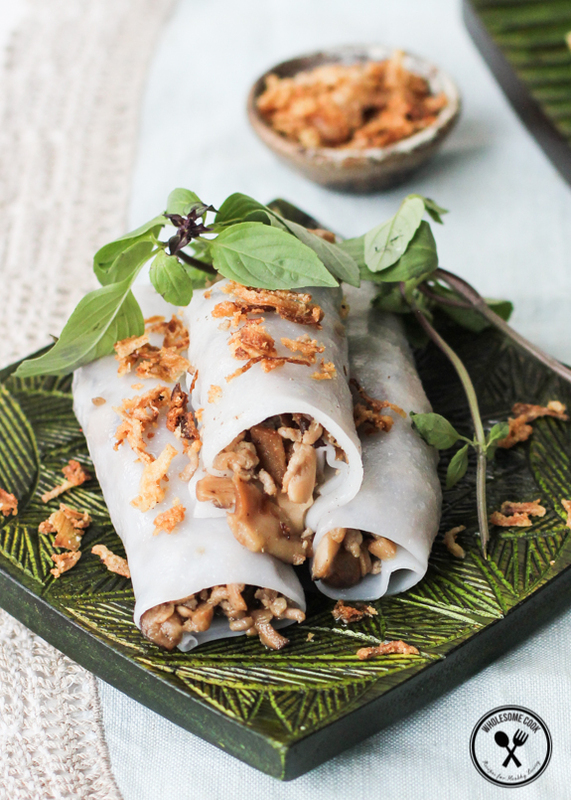 Banh Cuon or Pork and Mushroom stuffed Rice Noodle Rolls are one of my favourite Vietnamese dishes. 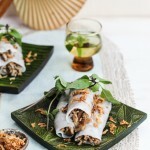 It wasn’t actually until I was asked to write and shoot the Vietnamese feature for Nourish magazine that I realised just how easy this dish is to make at home. Gluten and Dairy free. Sometimes the tastiest of things are the easiest to make. Wouldn’t you agree? Scrambled eggs. A cup of hot chocolate. A mish mash salad. Hang on a sec? A Pole cooking Asian food? Yup, and I love it. It’s no secret that I am head over heels in love with the flavours, cooking techniques and overall use of fresh herbs and spices. They inspire me often. I’ve shared my homemade Peking Duck recipe that rivals the ones we got to try in Beijing. Pumpkin soup tastes a hundred times better with coconut cream in it. I add Chinese five spice to stock. Have laksa for breakfast. Even my Spag Bol tastes better with red curry paste in it. This might be the reason why Sarah wanted me to adapt it for her latest I Quit Sugar for Life cookbook. It’s got that fab twist Sarah was after. Needless to say, when Anji asked if I’d be interested in doing a Vietnamese feature for the magazine, I was stoked and immediately said yes. 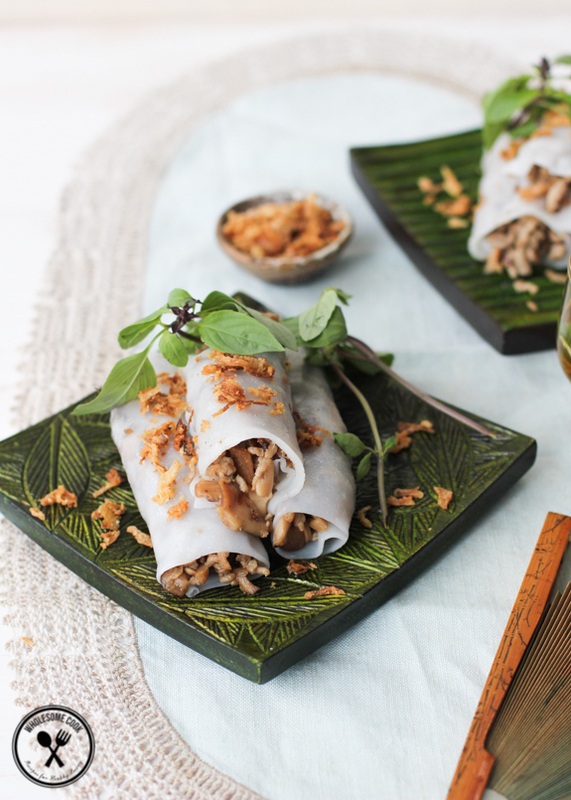 Vietnam is one of those magical places where food is omnipresent. And it’s not just about basic nourishment. It’s also about community, enjoyment and healing. Textures, fresh herbs with medicinal properties and distinctive flavours of fish sauce and spices. The next issue of Nourish magazine, on sale throughout September and October, will feature six of my favourite Vietnamese recipes. Some will even have a healthier twist. You can checkout my delicious soup roundup in the current July-August edition, too. While traditionally the dish is made with freshly steamed thin rice paper pastry, store-bought fresh rice noodle sheets are just as good. They are available from the refrigerated section of most Asian grocers. Dried shiitake mushrooms can be substituted with about one-and-a-half cups of finely sliced button mushrooms if you prefer. If you can’t find rice noodles, serve the mixture in lettuce leaves. Baby cos (romaine) leaves are perfect for this. >>> So, tell me, what sort of dishes and flavours have you been inspired by lately? While traditionally the dish is made with freshly steamed thin rice paper pastry, store-bought fresh rice noodle sheets are just as good. They are available from the refrigerated section of most Asian grocers. Dried shiitake mushrooms can be substituted with about one-and-a-half cups of finely sliced button mushrooms if you prefer. If you can't find rice noodles, serve the mixture in lettuce leaves. Baby cos (romaine) leaves are perfect for this. Cover shiitake mushrooms with hot water and soak for 10 minutes. Drain water and chop the mushrooms finely. Heat half the oil in a large pan set over medium heat and fry off onion and garlic until fragrant. Increase heat to medium high and remaining oil and pork. Working with a metal whisk or wooden spoon, break the pork into small granules as it cooks. Add mushrooms and fish sauce and stir fry to combine and for the meat to finish cooking. Sprinkle with freshly ground black pepper, to taste, if using. Set aside while you prepare the pastry. To prepare the pastry, steam each roll for 3 minutes or microwave on high for 20 seconds. Transfer to a sheet of making paper and unroll the pastry. Cut the sheet into two rectangles. Place about ¼ cup of the pork mixture near the closest edge of the pastry, then roll up. Repeat with remaining pastry and filling. Serve with a few sprigs Thai basil and a good sprinkling of fried shallots. This looks so amazing Martyna! I’ve tried your fennel soup from the current issue of Nourish and absolutely loved it. Felt so uplifted and refreshed. Can’t wait to see what the other dishes will be in the next mag. Congrats. Thanks Lara. I love that soup. In fact I kind of feel like making some tonight (we’ve had a birthday a couple of days ago and I feel like I’ve overindulged. Thanks for the prompt. I was recently inspired by your risotto – I’ve never made it before but your pictures were stunning and recipe simple to follow. I think this is another one I migt give a go. Hi Mel, that’s so good to hear. 🙂 enjoy if you try these. Haha! Thanks Angela. That spaghetti might be a tricky one to serve up for you, but this way there’s no requirement for cheese or gluten-y pasta! 🙂 this could be your best selling point. You can serve it with rice noodles. As I mentioned, it’s just steamed and fried rice grains that don’t sit too well with me, when processed into a flour rice seems to be a non-issue. Thank you Padaek. 🙂 those rice noodle sheets are a fantastic quick base for many mince dishes and stir fries (like Pad Se Ew). Hope you enjoy the rolls if you decided to cook up a batch. 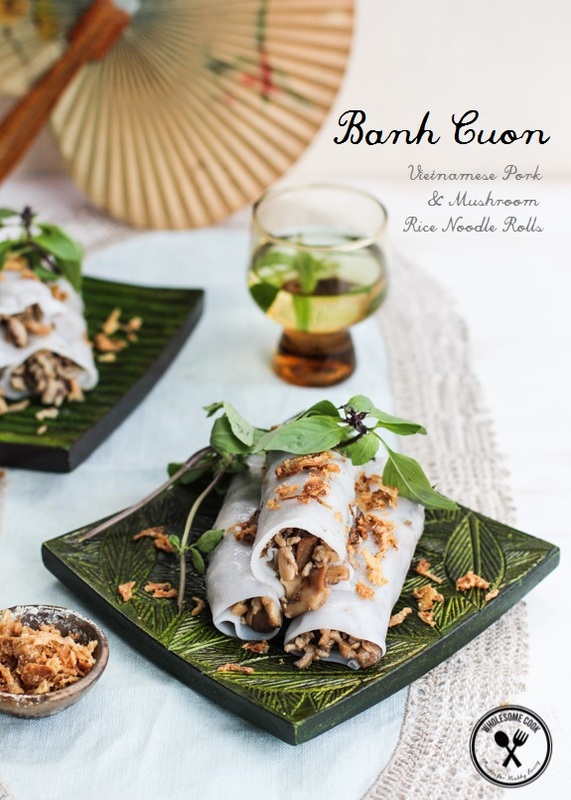 Banh Cuon for a Vietnamese Feature in Nourish Magazine is so amazing! I learned a lot and want to try this recipe at home. so delicious and beautifully captured as always.. pinned! You go from strength to strength. The recipes and the photography are first class. Hello from a recent Instagram follower. Imust say I love everything about your blog. Photos. Food. The unique bioindividuality approach. Well done and keep up the good work Martyna! After seeing this photo on instagram earlier today I had to come over for the recipe. Banh Cuon is soooo good. Great recipe + thanks for sharing. 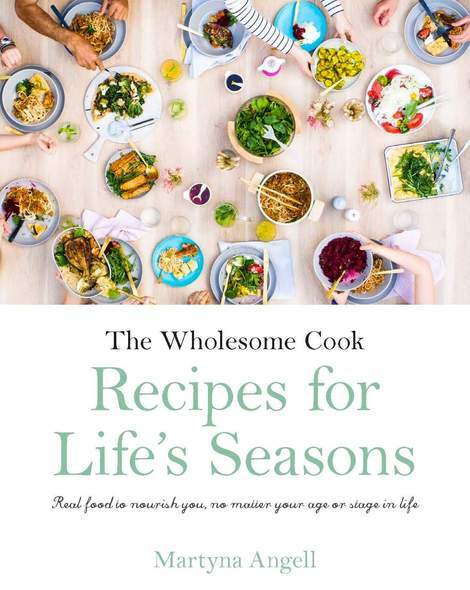 Thanks Aimee and welcome to the Wholesome Cook community! As you mentioned, my approach is very much about you as an individual so the blog features recipes that can be easily adapted or fall into specific dietary needs. I hope you enjoy browsing and cooking from the blog. This recipe is fantastic, and the photos are sublime. I can´t get over the injustice that I cannot have a bit of this food right this moment ! Fantastic !! So proud Miss . I am a Vietnamese guy . you are very creative. 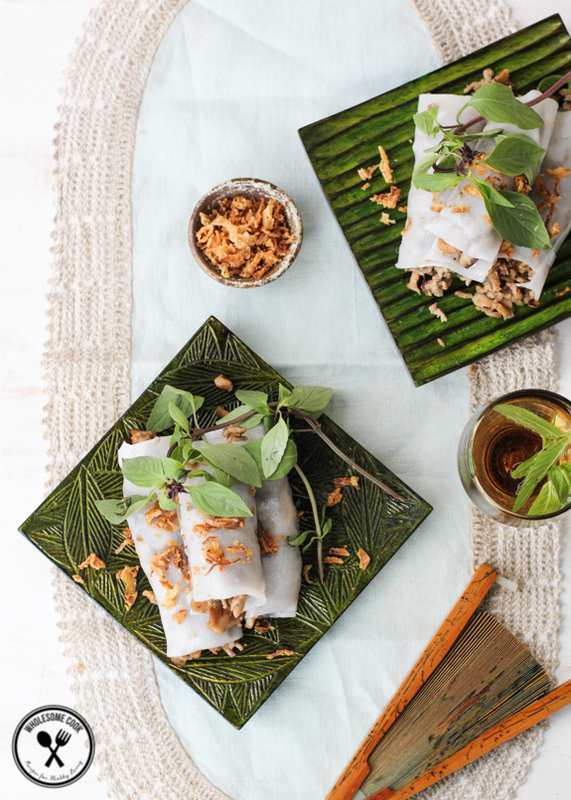 Who would have thought making bang cuon can be this quick. I remember my mom making it . took her the whole day . thanks for representing Vietnamese food.